There’s been a lot of discussion lately regarding Newton’s defunct Nexus Bus system, which ran from 1997 until 2003, and how the disappointing ridership on the Nexus might foreshadow problems with the four-shuttle system being proposed by Northland. But really, there are major differences between the two systems and the times. The Nexus Bus* was funded by a federal grant and about $40,000 annually from special permits to businesses like Newton-Wellesley Hospital. It initially ran three rush hour routes and three midday routes, later consolidated to the two routes seen on the map. Rides initially cost $0.50 to $1, later they were free. Ridership never met expectations. It was mainly used by the elderly and students. Service was discontinued when the federal grant and political interest ran-out. Why did it fail to gain ridership? 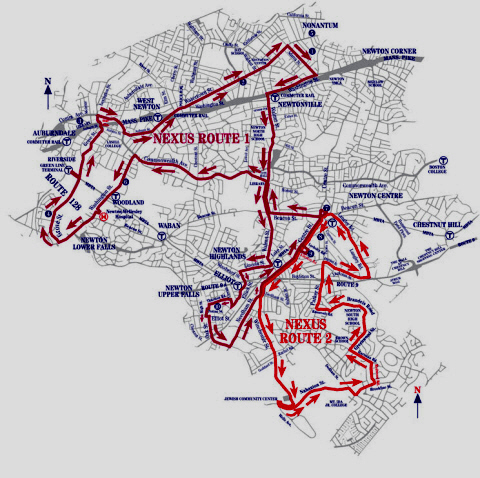 Nexus was clear failure on frequency: a single bus did each loop in one direction. Reliability was not recorded, but in pre-tracking app 1979 if you missed the bus or if there was a delay, you’d have no way of knowing. In contrast, bus use is growing today in areas where frequency is increased and buses are given priority to reduce travel delays such as, signal timing, bus lanes, and shelters with wifi so passengers can track arrival times. In spite of poor reliability ratings, low frequency, and daylight-only hours, over 1,700 people currently use Newton’s crosstown buses (52 & 59) every weekday. Additionally, Newton has seven private shuttle bus systems, plus specialized public buses, like school buses which can take students but not teachers or other staff to our schools. Northland’s proposed self-funded system is very different from Nexus. They plan to provide four separate, concurrent, shuttle routes, including one that circulates in Newton; one to the Highlands; an express shuttle to Boston; and a second express shuttle to Cambridge. The system will be operated by the 128 Business Council, which has decades of experience successfully operating these types of services. All four of Northand’s open-the-to-public shuttles will be wifi enabled and users will be able to track the bus in real time on their smart phones; all features not available in the unpredictable Nexus days. *Thanks to Lucia Dolan for her research on the Nexus system and for digging up the map. Is there a map of the proposed 4 shuttle routes? I didn’t see one in the linked articles. Thank you. Ppl dont like to wait for a schedule anymore.. its old fashioned. I would not b surprised to see lyft or uber get into this…. I think you make some great points about the flaws in the previous system, and how inherently different the times are. A similar service with regularly scheduled buses during key hours and a tracking app could really be successful and make a huge impact on local traffic. It would also be crucial to have it run in both directions! Nope. The difference wasn’t just direction, frequency or technology. The Nexus failed because it didn’t take people where they wanted to go. It was a meandering, inefficient route with no significant demand, there for its own sake. It’s not a comparison worth making. Yes, Northland shuttles look good by comparison and get some things right, but they compete with public transit when they could be complementary. Remember other shuttles offered as mitigation? The Atrium? Years from now, someone may have a similar post for the failed Northland routes. My wife was involved with that system at the time- some sort of town committee. In my opinion it failed because it didn’t LOOK LIKE A BUS. If it’s a bus I don’t care if it’s a shuttle bus or what you call it it’s got a look like a bus or people don’t know what it is. People think it’s some sort of private transportation, Local Motion, soccer team whatever. It should look like a city bus then people will know what it is. And there should be things that look like bus stops because then people will know what they are! @Adam – I agree with you. I have maintained that public transportation should be publicly run. And I don’t think the Nexus is a good reason to not try again and learn from our mistakes. I remember being at an aldermanic meeting years ago where people in my neighborhood were complaining about the Nexxus and the BC busses causing all this traffic. Eventually someone made the point that they paid too much money for their house to have busses driving by their house. They would be ok if the bus took a different route. Maybe this is another reason it failed. This was a similar time to when an alderman told me if I worked at Fidelity I didn’t need to take public transportation. I made even money to drive. How much did the Nexus bus cost over the 7 years. could flag down the bus for free. Nothing really worked. Insufficient numbers of people accessed the service. If it looks like a bus and stops like a bus, people will know it’s public transportation. There’s a similar concept in industrial design. If something looks like a button, they’ll push it. If it doesn’t look like a button, people won’t know what to do with it. I grew up in a small town in CNY of 25000 people. We had city buses. They had bus stops. They looked like buses. Why does newton think they have to have a “shuttle bus” if my town of 25000 had a bus? Just have a city bus service.